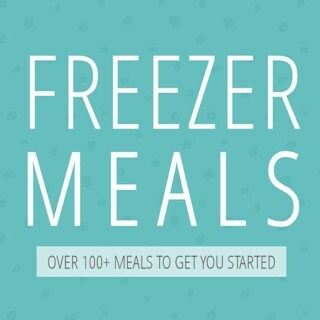 Today I am sharing another freezer meal. It is that time of year after all. 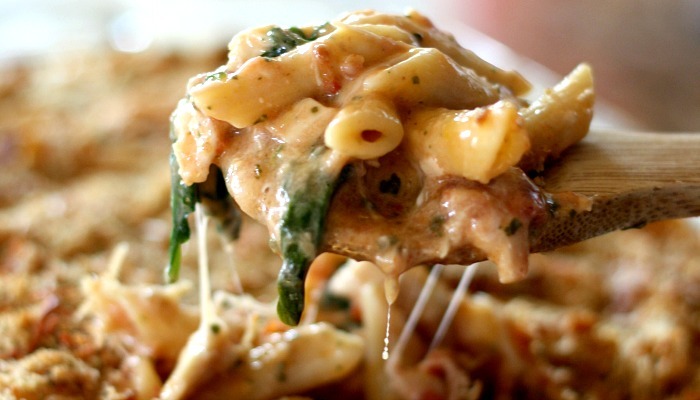 My Baked Chicken Pesto Alfredo Freezer Meal is one that really doesn’t get old. Plus it’s all real food baby! Nothing processed. 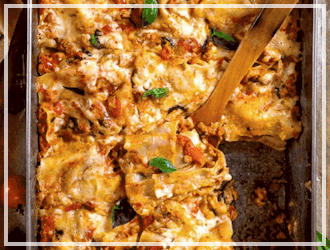 The flavors of this Italian dish mesh so well together and even though there are some “fancier” ingredients (says my kids) even my pickiest of eaters will eat it. 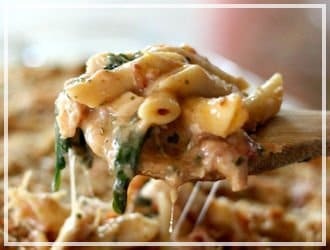 This baked chicken pesto alfredo has chicken, pesto, bacon, cheese, fresh spinach and some tomatoes all mixed together in a delicious white sauce. This pasta is da bomb! That’s right I said “da bomb” and I meant it. 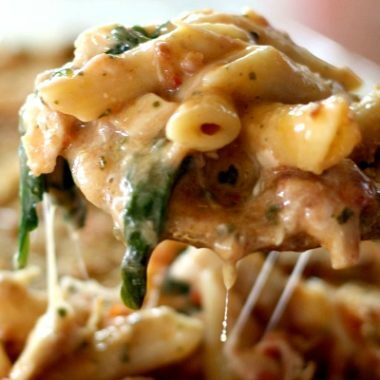 I think I will take it even further and say that my baked chicken pesto alfredo freezer meal is da bomb diggity! 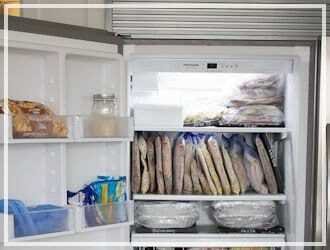 Here is how you can make this awesome freezer meal. 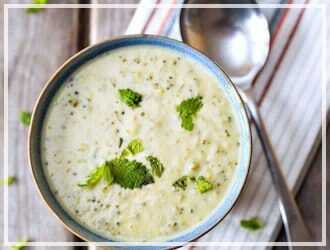 First you will make a simple white sauce. I add a little shredded chicken to mine, but that is totally optional. Set white sauce aside. Cook up 1 box of penne pasta and drain. 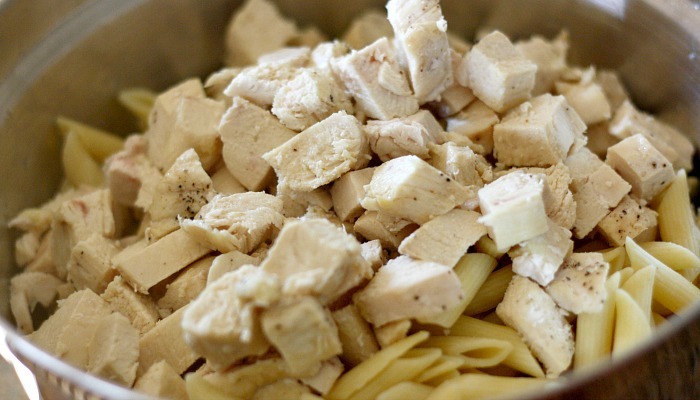 In a large mixing bowl add pasta, white sauce and cooked chicken. Mix well. Add cheese, fresh spinach, can of crushed tomatoes, basil pesto, milk and bacon. Stir until well combined. 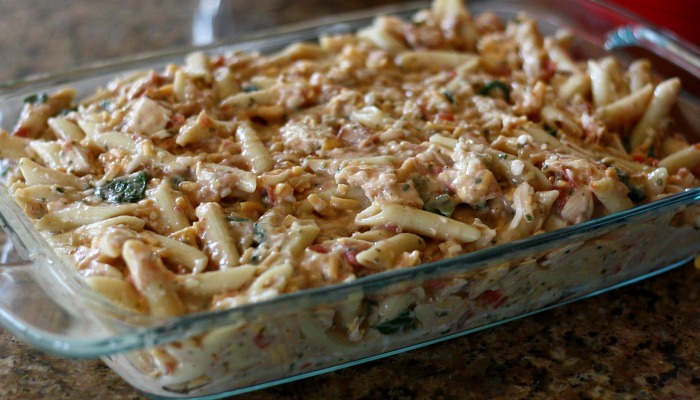 Pour pasta into a 9×13 casserole dish. 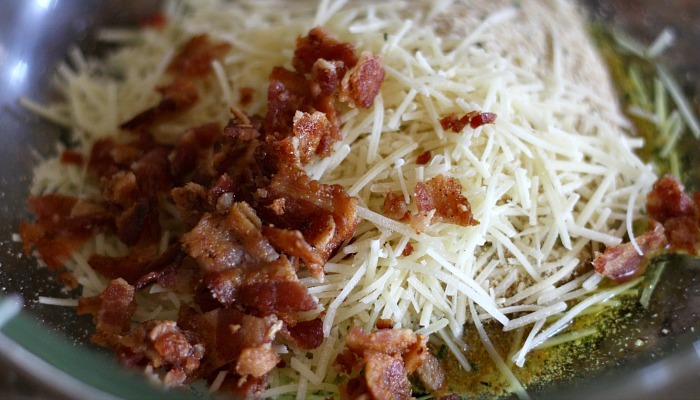 In a separate bowl mix Italian bread crumbs, Parmesan cheese, remaining bacon and olive oil. Sprinkle this mixture over the pasta. I find myself making grunting sounds with my mouth agape. Yes, I look like a zombie. Meeeee hungryyyy. Seriously this stuff is heavenly. 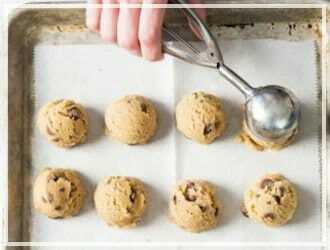 Go make some! 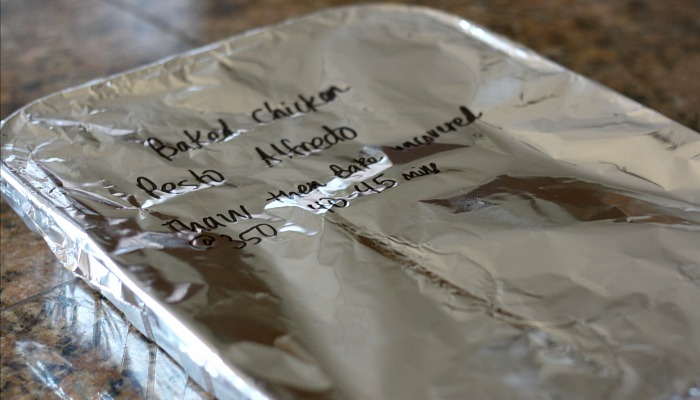 Freezer Meal Directions: Before baking cover with foil, label and freeze. 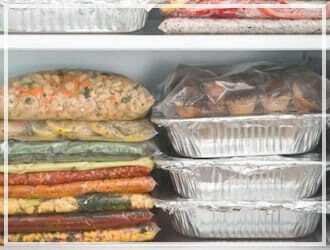 Thaw, remove foil and bake at 350 degrees for 45 minutes. 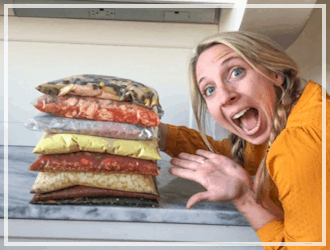 Check out my 50 freezer meals in a day post to learn about my favorite way to make freezer meals. 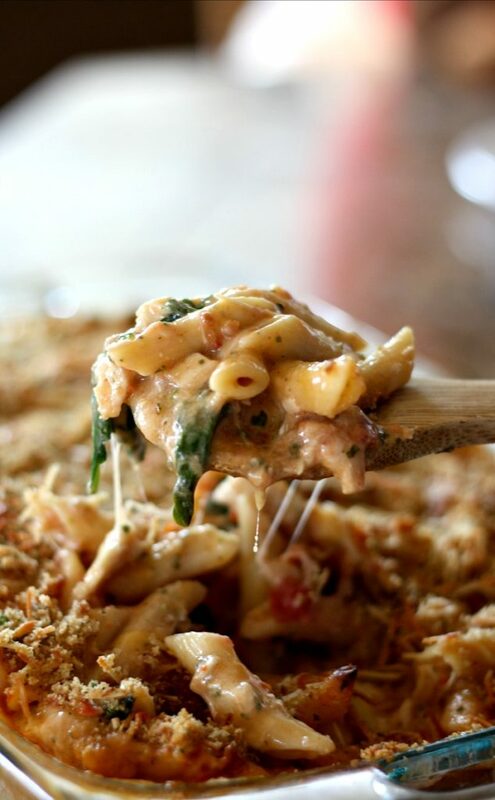 This baked chicken pesto alfredo freezer meal has chicken, pesto, bacon, cheese, fresh spinach and some tomatoes all mixed together in a delicious white sauce. Make a simple white sauce by melting butter in a pan over medium heat. Sprinkle in flour over melted butter and whisk constantly for 3-4 minutes over medium heat. Then add in chicken broth and whisk quickly together. Cook over heat until it’s thick and bubbles up. Set white sauce aside. 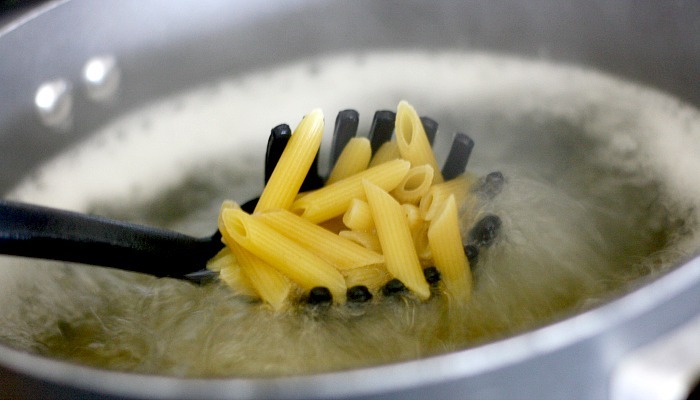 Cook penne pasta according to package directions. 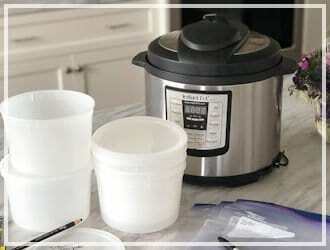 Drain noodles and then dump them into a large mixing bowl. 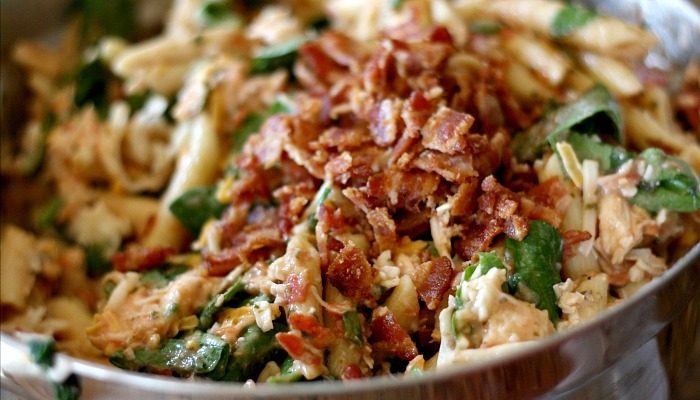 Add in white sauce, cooked chicken, cheese, spinach, crushed tomatoes, milk, pesto and 1/2 cup of the bacon. Mix well. 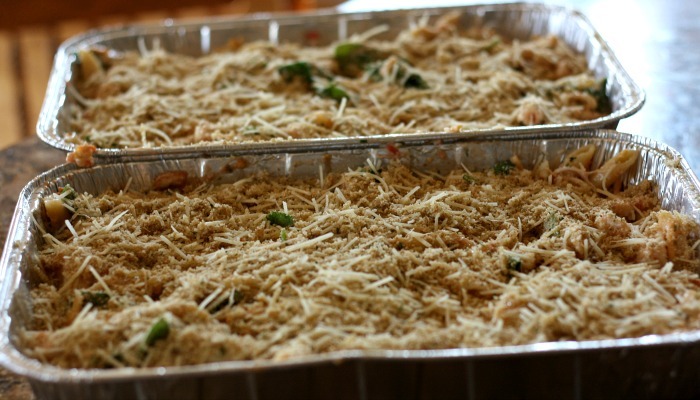 Pour pasta into a 9x13 baking dish. 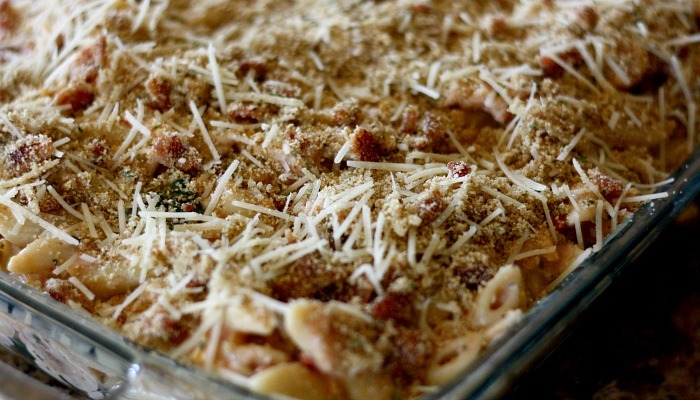 In a separate bowl mix together parmesan cheese, bread crumbs, remaining bacon and olive oil. 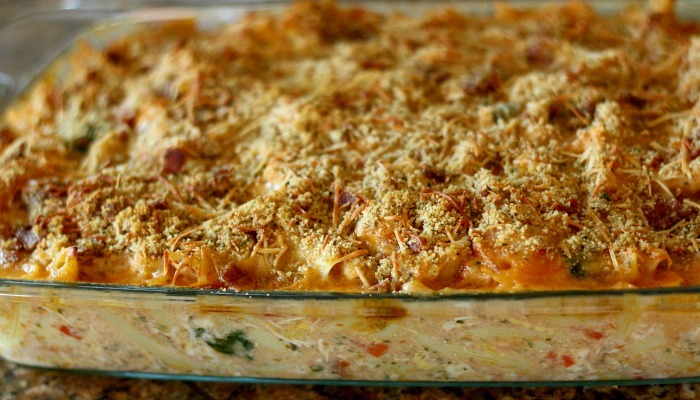 Cover pasta with bread crumb mixture and bake at 350 degrees for 45 minutes. A lot of work but delicious! I found the recipe to make enough for at least 12 people. It made enough for an 8×11 dish to eat and an 8 x 8 to freeze. I just doubled the topping. 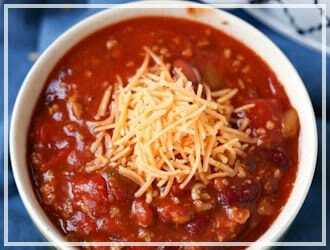 I was impressed by the flavor and my family loved it! This is probably a ‘newbie’ question but can you please clarify whether the “16 ounces” of pasta is a dry (uncooked) measure or whether I should cook it and THEN weigh it? Thank you in advance!!! 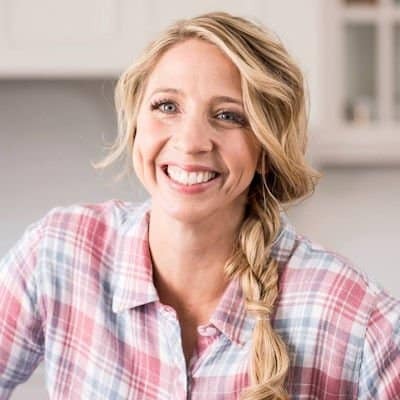 Great recipe collection, Karrie. 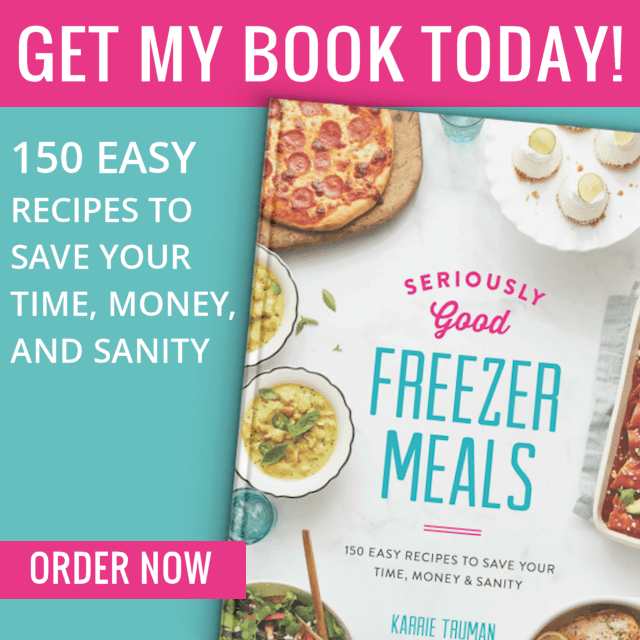 So very helpful for busy moms and dads! Was so excited to try this. In fact, doubled the recipe to give to friends. 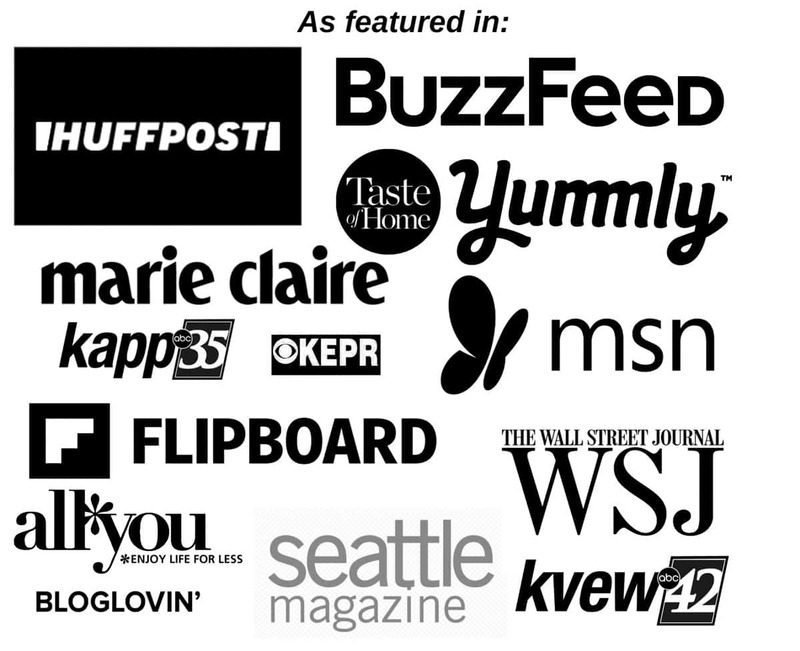 Gotta say…wasn’t overwhelmed. I found it to be a bit bland. Added a ton of garlic, would double the sauce next time. Just so so to my husband & I. Might sub Italian sausage instead of chicken if I made it a second time. How do you cook the chicken for this meal? Stove top?